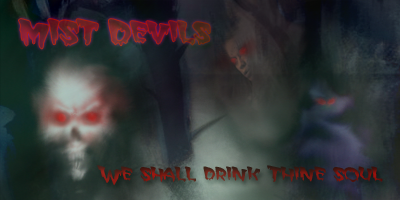 The Mist Devils are the children of the Dark God, the foul creations of the Lord of Corruption, the drifting minions of a God tormented and destroyed by His own actions. They are the living reflections of their God, cruel, pitiless, vindictive, elusive and corrupting. Yet once this was not how the Dark God was seen, was not how He acted and was. In the eons before they can to Tal'Vorn, the Gods existed in limbo, in a sort of cosmic balance, all of them a race beyond comprehension, all related and yet all very different. However two of them where even more opposed, exact opposites, a God of Truth and Justice and a God of Lies and Betrayal. They were the Gods Hevar and Ievar, twin Gods with opposing powers, eternally striving to find the balance, to find a point where they would not longer have to constantly push forth their side, or retreat in the face of their brothers onslaught. This continued even after the Gods had come to Tal'Vorn, the twin gods simply including the space around the blue world within their struggling, their pushing and warring. Yet time passes quickly for Gods and they lose patience with even the most fascinating things. Slowly Ievar's attention wandered from the battle He and His brother fought, instead pondering the depths of His own strength and what He was capable of. This done, He then lent His attention to Hevar instead and was astounded by what He found. Ievar and Hevar, though twin Gods, had not been born equal. Hevar, the elder, had been granted a power beyond that of Ievar for Hevar, as well as being the God of Justice, was also the God of Darkness. This was what Ievar had discovered, this was what Hevar had carefully kept from His divine brother, knowing what the result would be. Ievar was outraged. MIST DEVILS WILL NOT BE PLAYABLE! AS SUCH THIS WILL BE FINISHED AT SUCH A TIME AS I HAVE TIME TO DO IT! Thank you.